The most powerful prescription painkillers are called opioids, which are opium-like1 compounds. They are manufactured to react on the nervous system in the same way as drugs derived from the opium poppy, like heroin. The most commonly abused opioid painkillers include oxycodone, hydrocodone, meperidine, hydromorphone and propoxyphene. 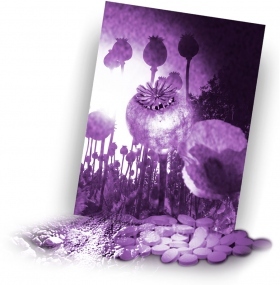 Oxycodone has the greatest potential for abuse and the greatest dangers. It is as powerful as heroin and affects the nervous system the same way. Oxycodone is sold under many trade names, such as Percodan, Endodan, Roxiprin, Percocet, Endocet, Roxicet and OxyContin. It comes in tablet form. Hydrocodone is used in combination with other chemicals and is available in prescription pain medications as tablets, capsules and syrups. Trade names include Anexsia, Dicodid, Hycodan, Hycomine, Lorcet, Lortab, Norco, Tussionex and Vicodin. Sales and production of this drug have increased significantly in recent years, as has its illicit use. Meperidine (brand name Demerol) and hydromorphone (Dilaudid) come in tablets and propoxyphene (Darvon) in capsules, but all three have been known to be crushed and injected, snorted or smoked. Darvon, banned in the UK since 2005, is among the top ten drugs reported in drug abuse deaths in the US. Dilaudid, considered eight times more potent than morphine, is often called “drug store heroin” on the streets. 1. opium: a brownish, gummy extract from the opium poppy. 2. narcotic: a drug affecting the central nervous system (brain and spinal cord), which can cause dizziness, lack of coordination and unconsciousness.